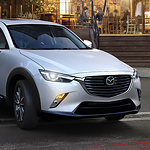 With the Mazda CX-3, the world has been shown that subcompact crossovers no longer need to be boring. This innovative vehicle was designed for discerning drivers who want comfort, style, and power. From its subtle lines to its sophisticated interior, it will be tough to find anything wrong with this crossover. Before you drive your new CX-3 off the lot, you will be able to personalize dozens of different details. You can choose from a wide variety of exterior colors including metallic gray, crystal blue, and jet black. You might also enjoy high-end upgrades like 18-inch alloy wheels or leather-trimmed seats. This innovative subcompact crossover was built with luxury in mind. You can learn more about this vehicle and schedule a test drive at our showroom. Please stop by Piazza Mazda of Reading today to speak with one of our friendly and knowledgeable sales associates.